Antimicrobial, antifungal and antiviral. Distilled from the leaves and twigs of trees growing in Madagascar, This Organic Niaouli Essential Oil has a bright crisp aroma similar to eucalyptus, but sweeter and softer, with a herbaceous and spicy backnote that makes it less harsh. Niaouli oil has been traditionally used in pharmaceutical and medicinal products such as cough drops, oral health sprays, gargles, and to flavour toothpaste for over 100 years. 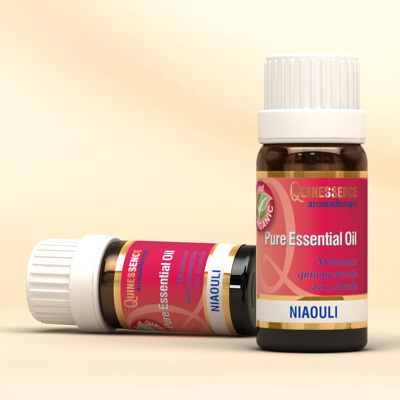 Organic Niaouli Essential Oil has an impressive range of therapeutic properties, probably because it is closely related to tea tree, eucalyptus and cajuput which are all highly versatile essential oils. If you have sensitive skin, this oil is an ideal alternative to tea tree since it is very gentle (even undiluted) yet it’s still a highly effective antibacterial, antifungal and antiviral agent. It can be used to disinfect skin abrasions, spots and cuts as well as combating acne-prone skin. As a potent immunostimulant that increases the antibody and white blood cell count, Organic Niaouli Essential Oil is perfect in massage blends for boosting the immune system. Just a few drops on a tissue can be used to relieve blocked sinuses or ease a tickly cough, plus it can be gargled at the first signs of a cold or sore throat to help prevent infection.